Will the Real Cavalry Manual Please Stand Up? I have a passion for horse books, especially the older classics. They’re a wealth of information and are unencumbered by commercialism- at least most of them. I love to read Lt. Col. Harry D. Chamberlin and I almost enjoy his 1934 “Riding and Schooling Horses” more than his1938 “Training Hunters, Jumpers, and Hacks’. “Riding and Schooling” has a little more to do with the rider and since I teach, I find that more interesting. These are two books I would recommend for anyone’s equestrian library. They are easily understood and the old photos are terrific. Finding them requires a little on line research and some perseverance but it is well worth the investment in time. And then there are the 3 volumes of “Horsemanship and Horsemastership” produced by the Academic Division, The Cavalry School, Fort Riley, Kansas. Chamberlin contributed a great deal to these manuals but being U.S. Military publications they are not the light read of the books he authored alone. These Cavalry manuals were first published in 1935 and had been out of print for many years. They were reprinted about 20 years ago by the U.S. Horse Cavalry Association and are readily available from the U.S.Cavalry Association. I’ll include that address at the end of this blog. I didn’t have the Cavalry manuals or Chamberlin’s works when I was a child, but I still had my favorites. I loved to read Margaret Cabell Self, but my prized book was “Learning to Ride, Hunt and Show” by Gordon Wright, published in 1950. “Learning to Ride, Hunt, and Show” is a fairly simple book to read, containing a basic teaching system. George Morris credits Gordon Wright for the system of riding he teaches today. And sure enough, when you compare George Morris’ 1971, “Hunter Seat Equitation” with “Learning to Ride, Hunt and Show” there are huge similarities. And then there is the 1962 “The Cavalry Manual of Horsemanship & Horsemastership, Education of the Rider, The official manual of the United States Cavalry School at Fort Riley” The cover of this edition says that it was “Edited for today’s civilian riders by Gordon Wright….” Boy was it! And more. But I get ahead of myself. Is This a Shocking Discovery? I systematically read all of the books of each author, in a somewhat chronological order. I’d read all of Santini, all of Harry D. Chamberlin (multiple times), and the Cavalry manuals “Horsemanship and Horsemastership” more than once, so I started on Gordon Wright. I re read “Learning to Ride, Hunt, and Show”, re read “The Riding Instructor’s Manual” written by Gordon Wright and Michael Kelley in 1975. And then I read Gordon Wright’s version of the Cavalry Manual. Did I say Gordon Wright’s version? I was brought up short by the writing style in this book. At first I thought, “Whew, Gordon Wright has certainly made the military manual more enjoyable to read.” And then I began to recognize another writing style. It didn’t take long to discover that much of the “editing” consisted of, in my opinion, adding huge sections of both of Harry D. Chamberlin’s works to the Cavalry manual volume II. A few paragraphs appear to be original Gordon Wright and in some sections small bits have been omitted, but for the most part this edited edition of “the official manual of the United States Cavalry School at Fort Riley” seems to be a compilation of “Horsemanship and Horsemastership” Vol. I, “Training Hunters, Jumpers and Hacks” by Lt. Col.Harry D. Chamberlin and “Riding and Schooling Horses”, also by Chamberlin. Hesitant to use the “P” word, but in my humble opinion, I believe Gordon Wright plagiarized the work of Harry D. Chamberlin. 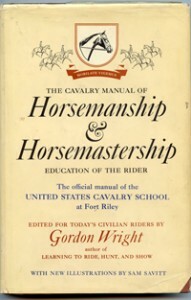 In a personal forward to his version of the official Cavalry Manual, Gordon Wright states “It is especially for this group that I have revised, edited, abridged, and brought out this edition off the famous Fort Riley book of instruction, “Horsemanship and Horsemastership.” and later in the forward Wright states, ” During my own years of teaching riding, I have found Horsemanship and Horsemastership to be the very foundation of the system which I teach today.” There is no mention of Harry D. Chamberlin anywhere in this work. At least George Morris had the integrity to give Gordon Wright the credit for the system that he (George Morris) uses today. I would love to hear from any reader of this blog who knows more history about the writing, editing and crediting of 1962 “The Cavalry Manual of Horsemanship & Horsemastership, Education of the Rider, The official manual of the United States Cavalry School at Fort Riley” edited etc by Gordon Wright, It certainly leaves me with many questions and I would be most interested in learning more. I have to admit that this “discovery” was pretty distressing to me. The “real” cavalry manual Horsemanship & Horsemastership, one may purchase through the US Cavalry Association or the US Cavalry Museum at Ft. Riley, Kansas. My dad served as in instructor at Ft. Riley at the same time as Mr. Wright. The actual manual, I think, offers a wider perspective….at least, based on the teaching my father passed on to me.